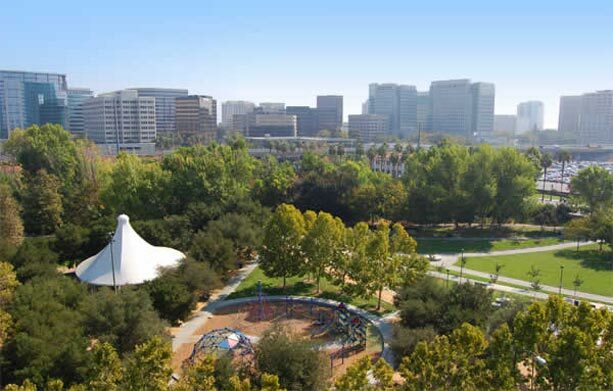 Arena Green is the section of the park located between Santa Clara Street on the south, Julian Street on the north, and directly across Autumn Street from HP Pavilion. Public restrooms are located near the Children’s Carousel. Visitors can visit the confluence of the Guadalupe River and Los Gatos Creek at Arena Green. Additional features of Arena Green include the Carousel & Tot Lots, the Five Skaters Artpiece, and a Donor Walkway. Adjacent to the Children’s Carousel are 2 brightly colored playgrounds for children both young and old, featuring swings, slides, a play fort and climbing structures. Comfortable park benches, a refreshment kiosk and restrooms are nearby. Due to City of San Jose budget cuts, the carousel has been temporarily closed. Efforts are underway to identify funding to restore its operation.